Free car and campervan hire can be found if your trip dates are flexible. Can you really get a hire car or campervan for free? The answer is yes and we show you how! Can you really get free Car or Campervan Hire or is it just a come-on? Amazingly enough, yes you can - although as these offers are always changing sometimes the best offers are £1 or $1 a day - hardly a bank busting sum! So there may catches and conditions but it is perfectly possible to find deals where the car or camper hire is free, or almost free. 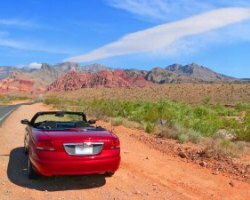 How is it possible to get these free car hire deals? It's all down to one-way rentals, where the customer picks up the vehicle from one location and returns it to another. This leaves the car or campervan out of position with too few at the original branch and too many at the destination. Of course, the hire company can get lucky and find another customer wanting to do the reverse journey but that's not always the case. That gives them a problem which creates an opportunity for a good deal. So it's all about relocating the hire car to where it's needed? Precisely. The pick up and drop off points are set to suit the rental company as are the dates. Of course, the hire company could always use a member of staff to relocate the vehicle but they'd have to pay wages, overnight expenses and coach/train/plane fare back and they won't get any income from the car or van or other work from the staff member while they do it. This way the car hire firm gets the vehicle back where they need it, doesn't have to pay anyone and can make a bit of money at the same time. Hang on, you said Free, how does the car hire company make any money? The hire may be free or it may just be discounted. Beware of the discounted prices, you may find that you can achieve deals that are just as good or better through conventional car hire. You may also have to pay for insurance and that may leave a large excess to pay and, even with the extra insurances, leave you liable for any damage to tyres, wheels, windscreens, underbody etc. Normally you will find that MoneyMaxim services including car hire excess insurance or campervan hire excess insurance will be a cheaper option. MoneyMaxim is the UK's only car hire excess insurance comparison site where insurers compete, often with discounts exclusive to MoneyMaxim users. How long do you get to keep the vehicle? To be frank, as little time as they can get away with, yet still entice someone to hire the vehicle and move it to where it needs to be. So don't expect to be given a week to cover 500 miles! These deals tend to suit those happy to spend more time at the wheel than exploring the countryside, or those who want to get from one location to the other. Some deals insist on there being two drivers for longer relocation trips. A good place to start hunting down the best deals is <a href="http://deals.vroomvroomvroom.com.au/" ">deals.vroomvroomvroom.com.au which has a summary of some of the deals around. Transfercar also have a variety of deals from 3 days to 6 days for a few dollars! Many rental companies will allow you to buy extra days at more normal rates if you want to take a bit more time over the journey but again, be aware of the increased costs which may mean again, you could do better with conventional car hire. Surely they won't pay fuel costs too will they? This keeps getting better doesn't it! Not necessarily all fuel costs but www.vroomvroomvroom.com.au do show many deals that include an allowance for fuel in the deal. Watch out for mileage restrictions in the Terms & Conditions. They can be very tight and you'll pay for excess mileage. For example a Cairns to Alice Springs deal allowed 2,475km, Google Maps reckons it's a 2,429km drive leaving you just 46km spare, so it is highly likely that you could exceed your allowance if you divert from the main route so check how much that's going to cost you. These deals are mostly available at short notice so it's hard to plan in advance and there may not be a deal when you want one so flexibility or being in the right place at the right time is crucial. Like most car or campervan hire, the hire company will take a credit card pre-authorisation as security, typically between $1,000 - $2,000 so make sure you have enough credit available on your credit card. In addition, you may be asked for a deposit, typically $100 - $250 to secure the booking, refundable only when you deliver the vehicle on time to the specified destination. They are primarily delivery runs not holidays so you need to be comfortable with driving the distances expected, also watch out for penalties for late delivery or if you are taken ill and have to abandon the trip part way through. Of course this may not be suitable for your needs, so please feel free to compare motorhome hire to find the best deal for you. Using this facility enables you to tailor your trip to completely suit your requirements.